As the days begin to countdown to the expected reveal of the iPhone 7 in September, we're getting rumours and speculation popping up at a rate of knots - from the size of the device, to the style of camera, to the inclusion/exclusion of a headphone jack, it's proof positive we're all hungry for a new Apple smartphone in our lives. We've also been getting plenty of leaked photos and 3D renders, and the latest one - from French tech site Nowhereelse.fr - seemingly confirms a number of these hardware features in one speculative swoop. For a start there's the size - it's clearly a 4.7-inch model, a change in size that falls in line with a number of other leaked schematics we've seen before. The rear panel is a lot sleeker too, again as seen before in previous leaked media, suggesting Apple is taking a few leaves out of Samsung's Galaxy S7 book with a noticeably smooth and uninterrupted design. Like many of the purported changes to the iPhone 7 design it's a small transition, but one that could help Apple dog and bone feel a lot fresher. While the design feels like a natural evolution of what Apple has been doing with the iPhone 6S, the camera does feel like a more pronounced change. The camera has a lip running around its edge, potentially dismissing earlier reports that the iPhone 7's rear camera would sit flush within its tweaked design. 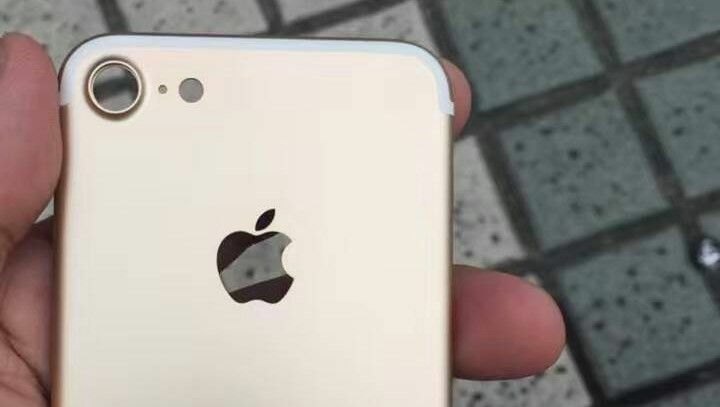 The pictured model appears to come in a gold finish - considering we've already reported that the iPhone 7 will likely come in a blue model as well, a gold version does seem plausible. The back is also surprisingly spartan with no words engraved on the back save the iconic Apple logo. You definitely get the sense that the iPhone 7's design team has been subtely trying to hark back to its simpler origins. While not pictured, we do know that the now annual 'Plus' version of the iPhone 7 could be a 5.5-inch model with a rather tasty Dual-Lens rear camera that will take the handset's already impressive HD camera and make it even more of an attractive offering for the Instagram generation.